Kīlauea Volcano is a shield volcano located on the eastern slope of Mauna Loa Volcano on the Island of Hawai‘i. The volcano is considered to be in the shield-building stage of Hawaiian volcanism. 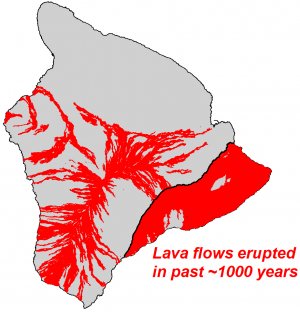 The Island of Hawai‘i with lava flows erupted in approximately the past 1,000 years shown in red. Located on the southeastern side, Kīlauea Volcano is 90% covered with young flows. There is a lack of old exposed rock at Kīlauea, which makes it difficult for geologists to piece together its complete eruption history. Only about 10 percent of Kīlauea's surface consists of rock older than 1,000 years. The other 90 percent of the volcano's surface is covered by lava flows younger than 1,000 years, and about 20 percent of those flows are less than 200 years old. The Hilina Basalt formation, exposed in Hilina fault scarps on Kīlauea's central south flank, includes the oldest lava flows found above sea level, which erupted around 50,000 to 70,000 years ago. 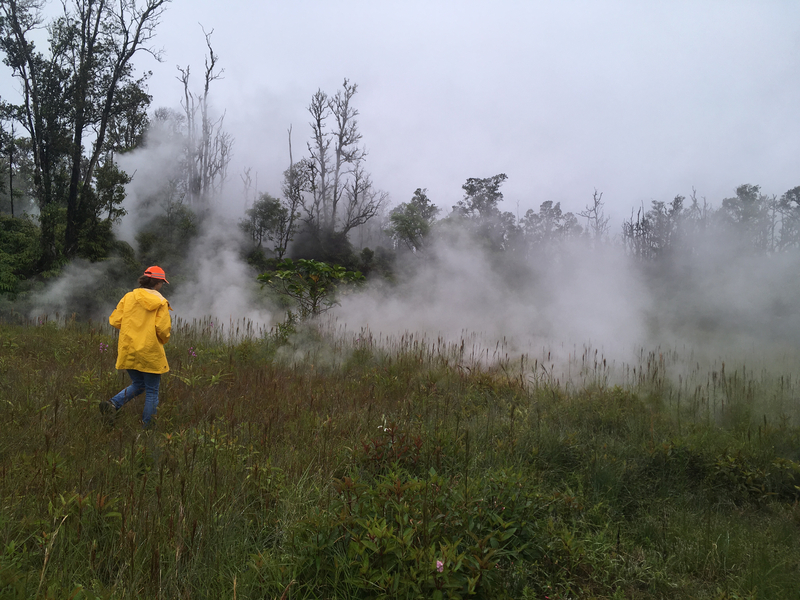 Older rocks have been recovered from Kīlauea's submarine slopes and drill cores, providing some clues to the volcano's origin. Estimates for the age of Kīlauea's first-erupted lavas continue to evolve as more samples are collected and various dating methods are used. 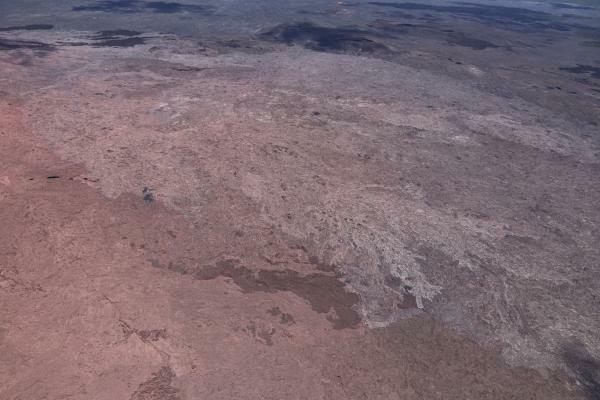 Current research indicates the first alkali-basalt lava flows erupted onto the ocean floor between 210,000 and 280,000 years ago, and the volcano transitioned from its pre-shield to shield-building stage about 155,000 years ago. 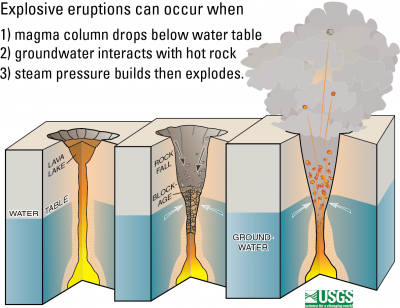 At Kīlauea, when the lava column drops below the water table, groundwater may come into contact with magma or hot rocks, causing violent steam explosions. Long periods of explosive (tephra-dominated) and effusive (lava-flow-dominated) activity have alternated at Kīlauea for the past 2,500 years. Scientists infer that the eruption style is determined by the amount of magma being supplied to the volcano. When magma supply is high, the summit caldera fills and feeds voluminous lava flows from summit and rift zone vents. When the magma supply drops, the caldera collapses. When the caldera floor is deep enough to be at or near the water table (about 500 m (1640 ft) deeper than present), water can seep into the vent to trigger steam explosions. Eventually, magma supply increases and effusive eruptions dominate as many lava flows fill the caldera and erupt from the rift zones. 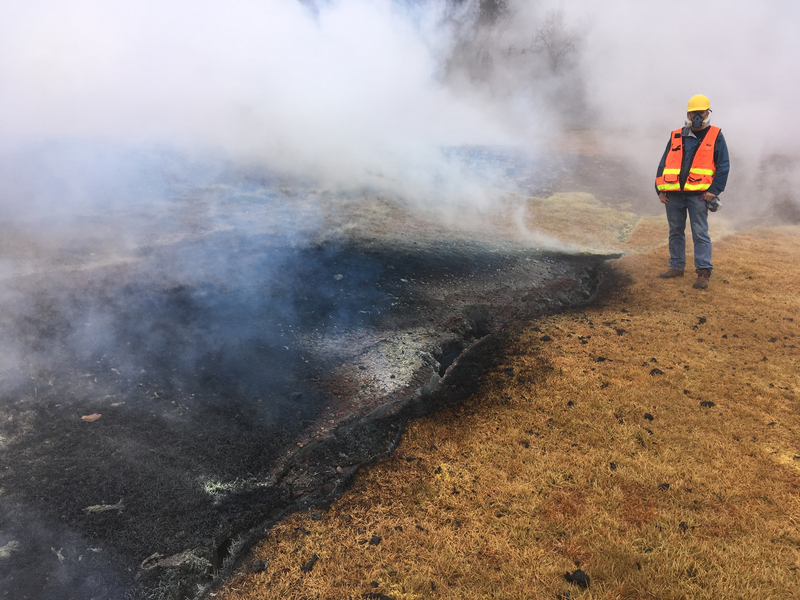 Prolonged periods of explosive eruptions at Kīlauea may require the presence of a caldera to sustain them. 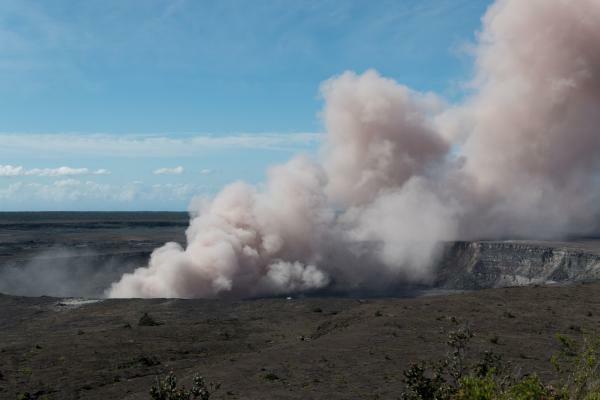 Scientists estimate that during Kīlauea's past 2,500 years a deep caldera has existed about 60 percent of the time, which included two long periods of sporadic violent explosions. One lasted 1,200 years, ending in about 1000 CE; the other lasted 300 years, between about 1500 and 1800 CE. Since Kīlauea's surface is dominantly covered by young deposits, only the eruption record of the past 2,500 years is suitably well-known. Effusive lava flows were the norm until about 2,200 years ago when the Powers caldera formed—the precursor to the present-day summit caldera. The caldera collapsed to a depth of at least 620 m (2030 ft), where magma and external water interacted to trigger powerful phreatomagmatic (water plus magma) eruptions. 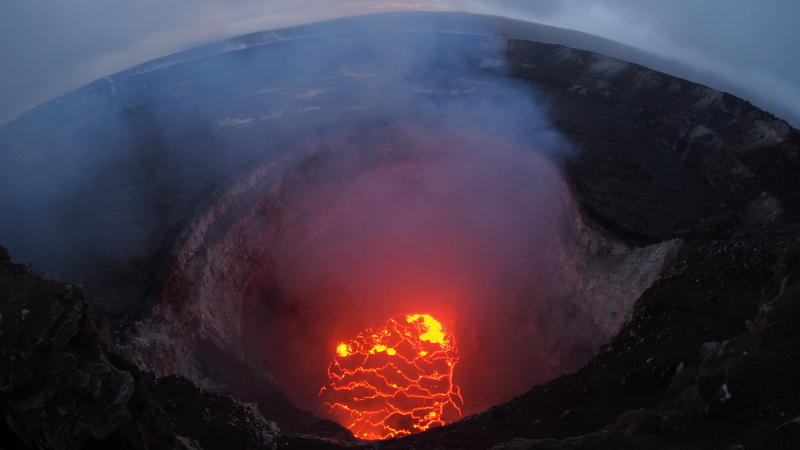 Numerous explosive eruptions lasted for a period of about 1,200 years, producing the Uwekahuna tephra. 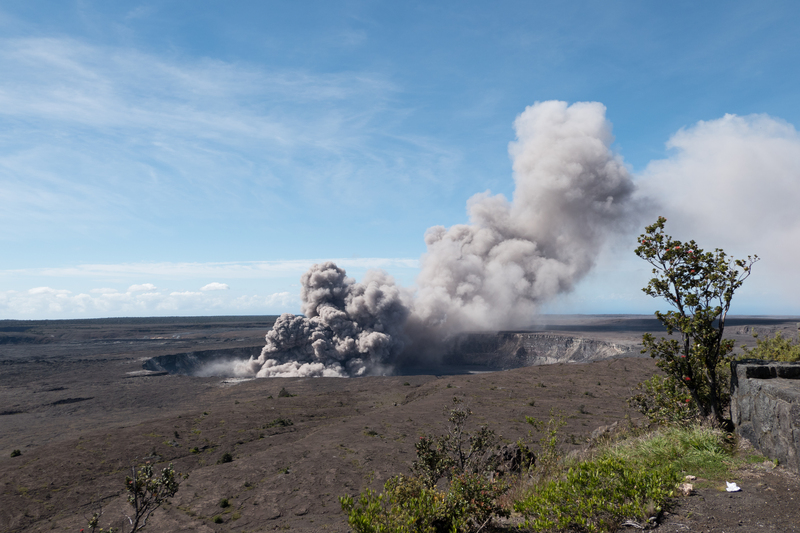 Sometime between 850 and 950 CE, the most powerful explosive eruption known to have occurred from Kīlauea sent rocks weighing 4.4 kg (9.7 lbs) at least 5 km (3 mi) from the summit. Golf ball-sized rocks fell at the coast, 18 km (11 mi) away. 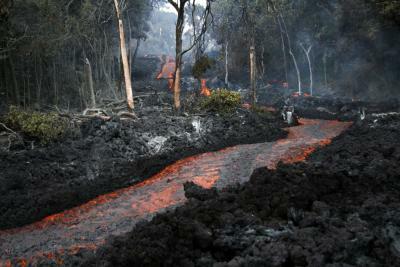 A stream of lava from Pu‘u ‘Ō‘ō flowing through the forest in the Royal Gardens subdivision, February 28, 2008. The lava stream is about 3 m (10 ft) wide. 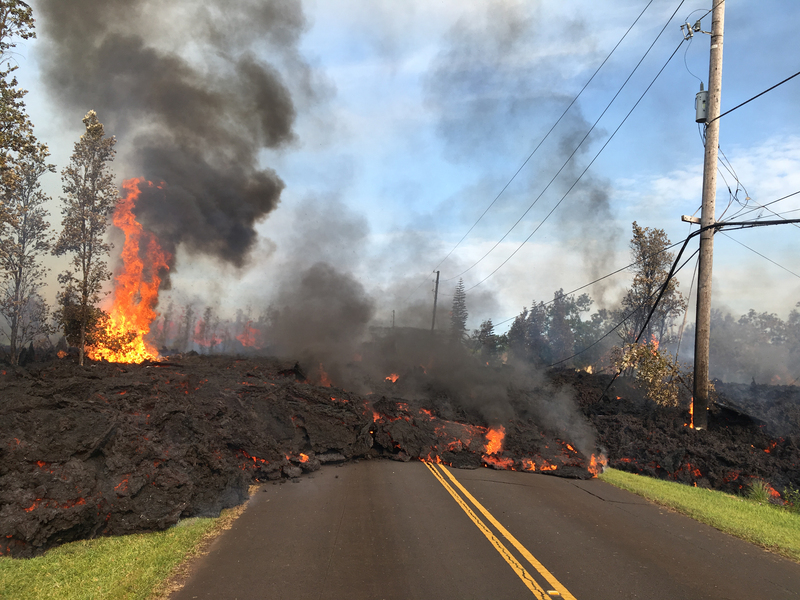 Kīlauea Volcano, Hawai‘i. Lava flows finally began to erupt again about 1,000 years ago, breaking the 1,200-year-long interval dominated by explosive eruptions. 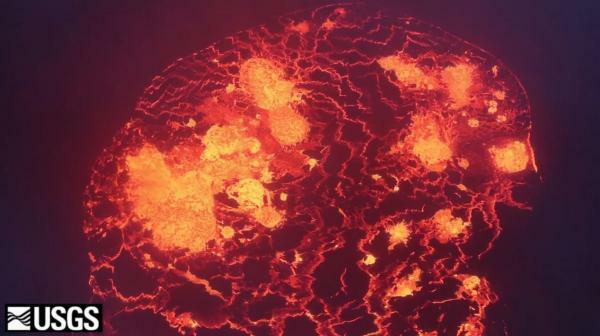 Lava completely filled the summit caldera, then overflowed to form a new shield—the Observatory shield—in place of the caldera. Flows spilled into the surrounding forest, which had grown during the previous centuries, and lava also erupted frequently along the volcano's east and southwest rift zones. Some archaeologists think people first arrived on the island in the beginning half of the 13th century, 200 to 250 years after the Observatory shield started to form. Construction of the shield ended around the year 1400 CE. 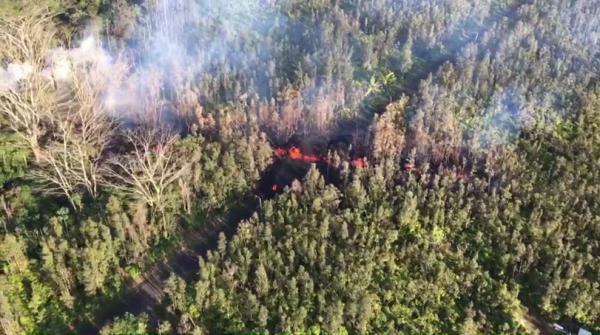 Soon after, lava erupted from a vent on the east side of the shield near the present-day Thurston lava tube (Nāhuku). This effusive eruption lasted for about 60 years, the longest-lasting lava flow witnessed by human inhabitants in Hawai‘i. 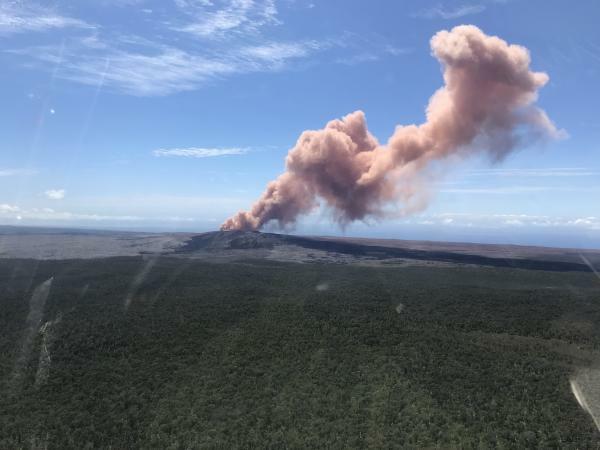 Known as the ‘Ailā‘au flow, it covered much of Kīlauea, from the summit to the coast on the north side of the East Rift Zone, with some lava spilling southward to the modern Keauhou Landing. Kīlauea Caldera simplified geologic map, month/year labels on lava flows. Entire caldera floor covered either by lava flows erupted since 1885 or by the early 19th century Keanakāko‘i Ash (not on map). The present-day Kīlauea caldera formed by collapse just after the ‘Ailā‘au eruption ended (about 1470 CE) and before the Keanakāko‘i eruptions began (about 1510 CE). The caldera floor dropped to a depth of about 600 m (1970 ft), with diameters of 3.5 km (2.2 mi) by 3 km (1.9 mi), which is estimated to be a collapsed volume of 4 to 6 km3 (1 to 1.4 mi3). Traditional Hawaiian chants suggest that Hi‘iaka, a sister of the volcano deity Pele, dug a deep caldera after the ‘Ailā‘au eruption. This oral tradition describes the caldera's formation by a dramatic collapse of the volcano's summit area. So, how did the caldera form? To trigger a collapse, the material must be removed from the magma reservoir within the volcano, creating a void into which the overlying rocks fall. The volume of lava erupted during the 60-year ‘Ailā‘au eruption matches the inferred caldera collapse volume. Perhaps incremental collapses occurred as the magma storage region gradually emptied, then eventually led to a final large collapse as described in Hawaiian chants. 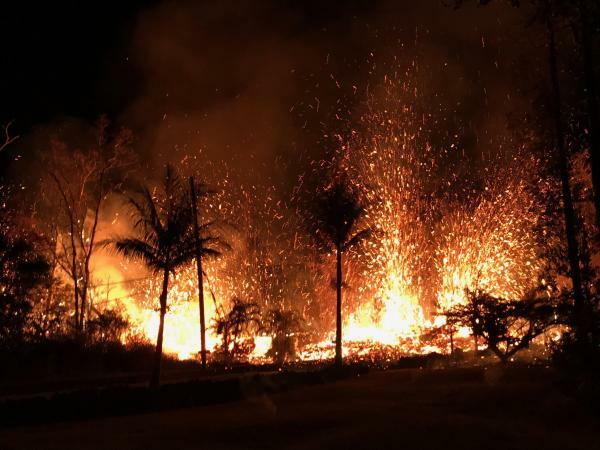 It is possible that toward the end of the ‘Ailā‘au eruption, the dwindling magma supply failed to replenish the magma storage system, which collapsed as it emptied. 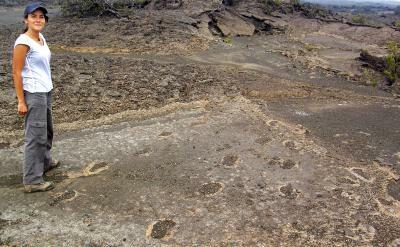 Footprints left in wet volcanic ash when a group of Hawaiian travelers walked through the area after an explosive eruption in 1790 CE deposited 2 cm (1 in) of ash southwest of Kīlauea's summit. Towering lava fountains, likely more than 600 m (2,000 ft) high, roared from Kīlauea caldera just after it formed and began 300 years of explosive eruptions that ended in the early 19th century. During that time, at least four strong explosive eruptions sent tephra high into the jet stream, with ash falling over a broad area east and offshore of the volcano. This eruptive period blanketed the summit area with an 11-m- (35-ft-) thick deposit known as the Keanakāko‘i tephra. Near the end of this explosive period in 1790, a series of explosive eruptions sent searing pyroclastic surges at least 3.5 km (2.1 mi) down the west side of the summit area. 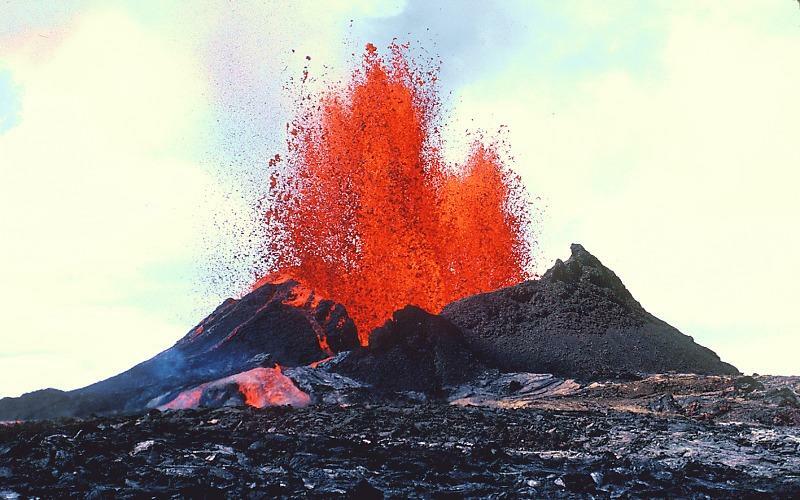 This was the deadliest eruption known from a U.S. volcano (but at the time, it was the Hawaiian Kingdom). Several hundred (and perhaps more than a few thousand) people were killed within a few hundred meters of where the Hawaiian Volcano Observatory and the National Park's Jaggar Museum are located today. The unfortunate victims died as a result of the hot, ash-rich surge that both suffocated and burned them. 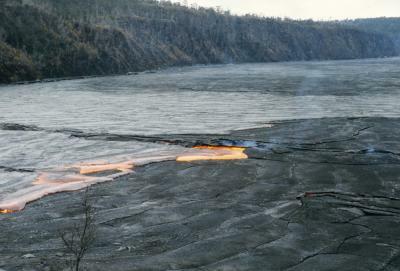 A three-day long eruption in July 1974 sent lava flows onto the floor of Kīlauea Volcano's summit caldera, where they spread out beneath the western caldera wall. Only a few lava flows have erupted during the 300 years of explosive activity, but that changed in 1823 when the volcano reverted to an effusive interval that continues to this day. Since then, Kīlauea's summit caldera has been slowly filling with lava flows, and, at a depth of 120 m (400 ft) today, much shallower than its past depth of at least 600 m (2000 ft). In addition to summit eruptions, numerous lava fountains and lava flows have issued from vents along the volcano's southwest and east rift zones. Explosive eruption column from Halema‘uma‘u Crater 11:15 a.m. May 18, 1924 - one of many in a series of similar events during May 11-27. 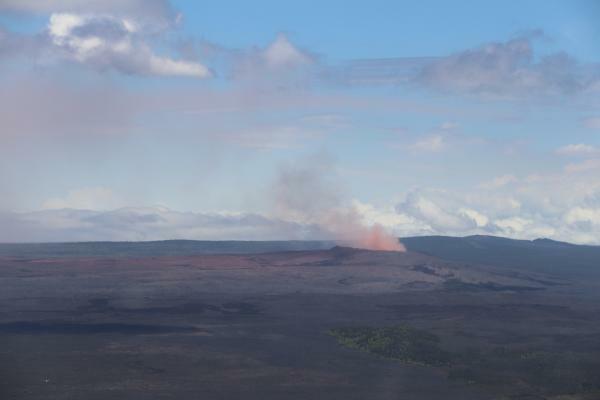 Photo from northwest rim of Kīlauea summit, the present site of HVO. The first explosive eruption on the volcano since the early 19th century took place in 1924 within Halema‘uma‘u Crater on the floor of Kīlauea's summit caldera. The eruption occurred days after the active lava lake drained away, with the magma probably intruding into the volcano's East Rift Zone. 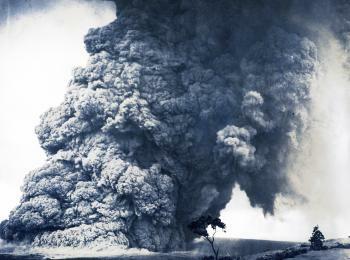 For 17 days, rocks, ash, and dust erupted in dramatic clouds rising from the crater. Rocks weighing many tons were hurled as far as a kilometer (0.6 mi) from the crater. 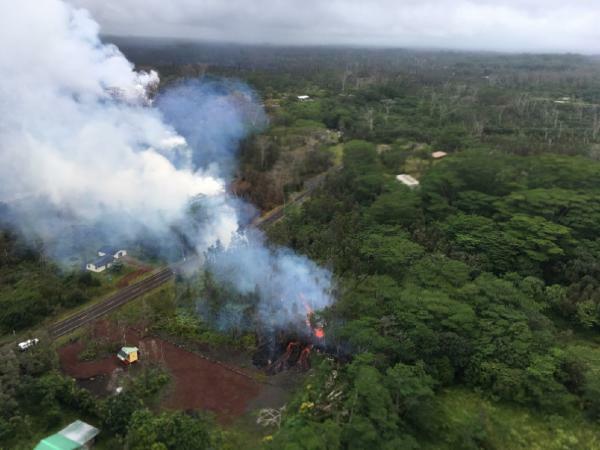 There was some subsidence within Halema‘uma‘u, but the caldera did not deepen appreciably. 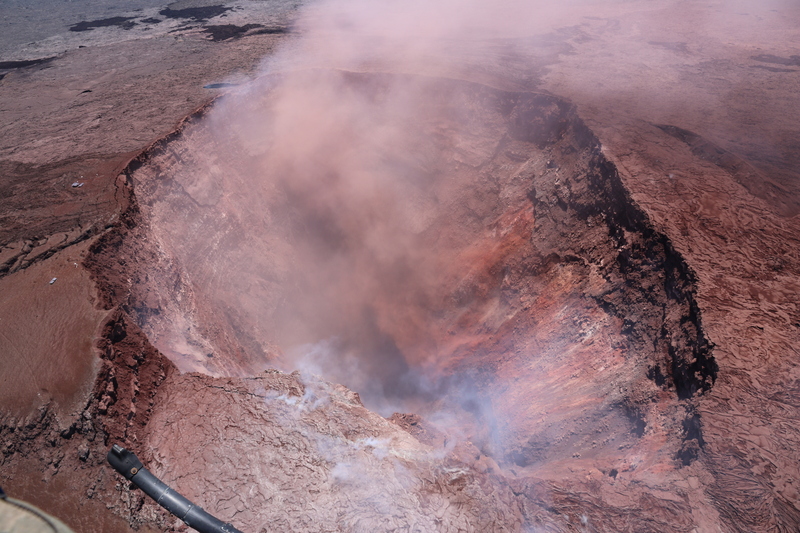 Within two months, lava reappeared in the crater and above the level of the water table, which inhibited additional large steam explosions. Although the period of explosive eruptions was brief and violent, they were small compared to those between 1500 and 1800. 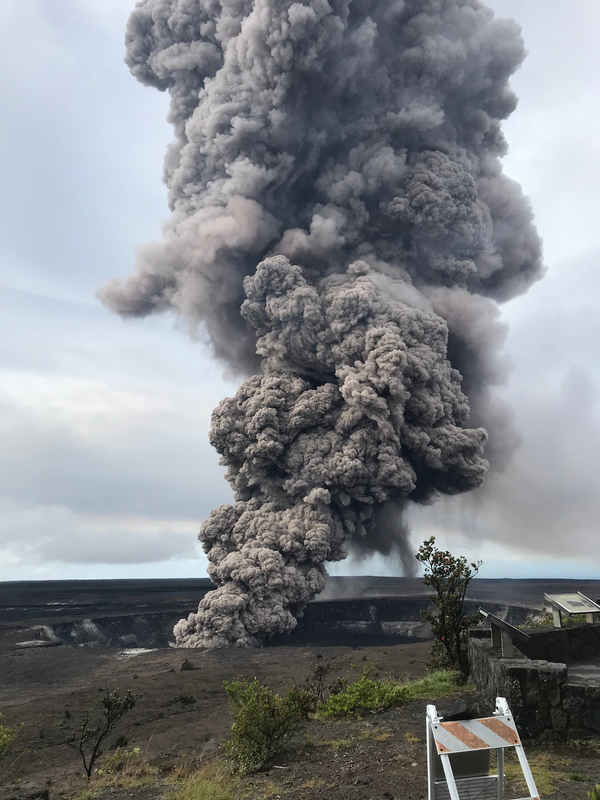 Having pieced together the recent geologic past of Kīlauea, scientists conclude that the volcano will eventually return to a long period of mostly explosive activity, just as it did around 1500 CE. This future explosive period will probably accompany a significant decrease in the magma supply rate and be initiated by the collapse of a new caldera to the depth of the water table, which today is about 615 m (2015 ft) below the present high point on the caldera rim. For now, effusive eruptions dominate Kīlauea. Left: At 9:06 a.m. HST, an ash plume rose from the Overlook crater at Kīlauea's summit. Similar to recent plumes, this event was likely caused by a rockfall from the crater's steep walls. The plume's reddish color is most likely from altered rock and ash fragments that fell into the deepening conduit. Right: At 9:17 a.m. HST, another weak ash plume rose from the Overlook Vent in Halema‘uma‘u crater, producing a slightly more energetic and darker plume. This second plume lacked the pink altered ash that was in the earlier plume, apparently consisting of more unaltered (therefore darker) rock fragments. This plume also was probably caused by rockfall into the deepening vent, not related to groundwater and steam-driven explosions. At 08:08 a.m. HST. Geologist photographs a steaming crack about 50 meters (164 feet) west of Highway 130 in an area of earlier cracking. Left: At 7:43 a.m. HST. Geologist examines steaming crack in property on Ala`ili Road. Right: At 1:23 p.m. HST. 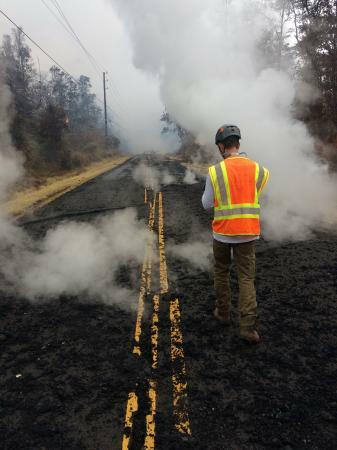 New steaming area opens on Hwy 130. Cracks which crossed Hwy 130 yesterday are marked by the barriers in the distance. At 1:54 p.m., HST. Geologist inspects a crack that widened considerably in the past day on Old Kalapana Road. In other areas, new cracks have appeared along sections of Highway 130 in the past day, some with fume escaping. 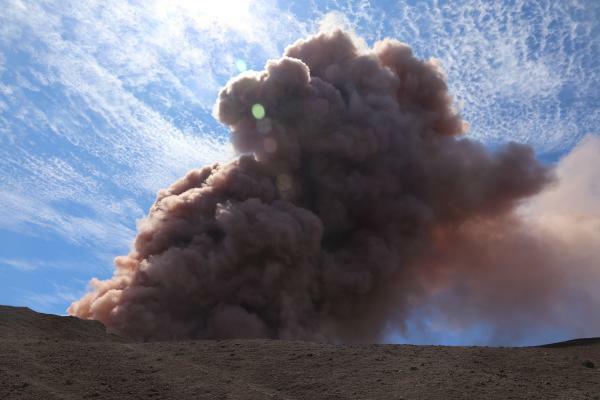 Ash column rises from the Overlook crater at the summit of Kīlauea Volcano. HVO's interpretation is that the explosion was triggered by a rockfall from the steep walls of Overlook crater. The photograph was taken at 8:29 a.m. HST from the Jaggar Museum overlook. The explosion was short-lived. Geologists examining the ash deposits on the rim of Halema‘uma‘u crater found fresh lava fragments hurled from the lava lake. This explosion was not caused by the interaction of the lava lake with the water table. When the ash cleared from the crater about an hour after the explosion, geologists were able to observe the lava lake surface, which is still above the water table. Left: At 09:53 a.m. HST. Severe ground cracks associated with fissure 14 in Leilani Estates. Right: At 10:10 a.m. HST. Yellow street lines show the offset of cracks on Leilani Street, Leilani Estates. Left: At 11:47 a.m. HST. HVO geologist measured a temperature of 103 degrees C (218 degree F) at a crack along Nohea Street, Leilani Estates. The asphalt road was describes as "mushy" from the heat. Right: At 13:00 p.m. HST. 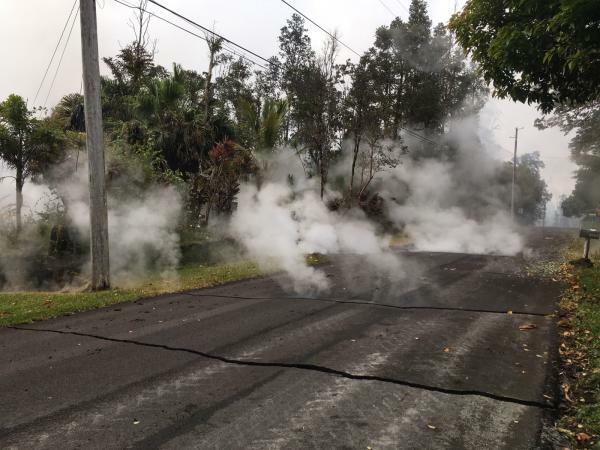 A new fissure extended across Pohoiki Road between the intersections of Leilani Avenue and Hinalo Street. Scientists had difficulty viewing the entire fissure from their location, but reported lava spatter 5 m (7 ft) high as well as a loud jetting of gas from the fissure. 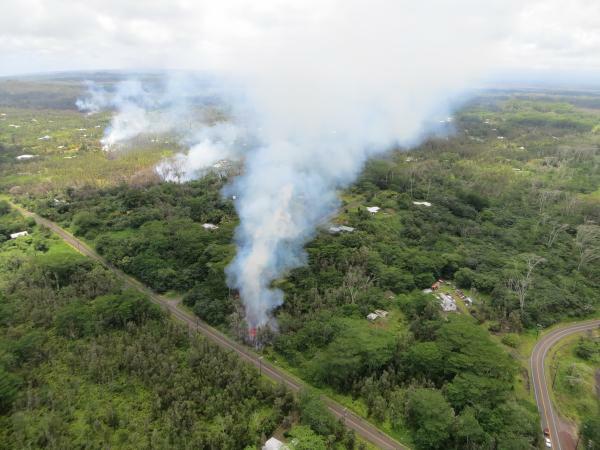 This photo shows the steaming fissure extending across Pohoiki Road. At 13:00 p.m. HST. 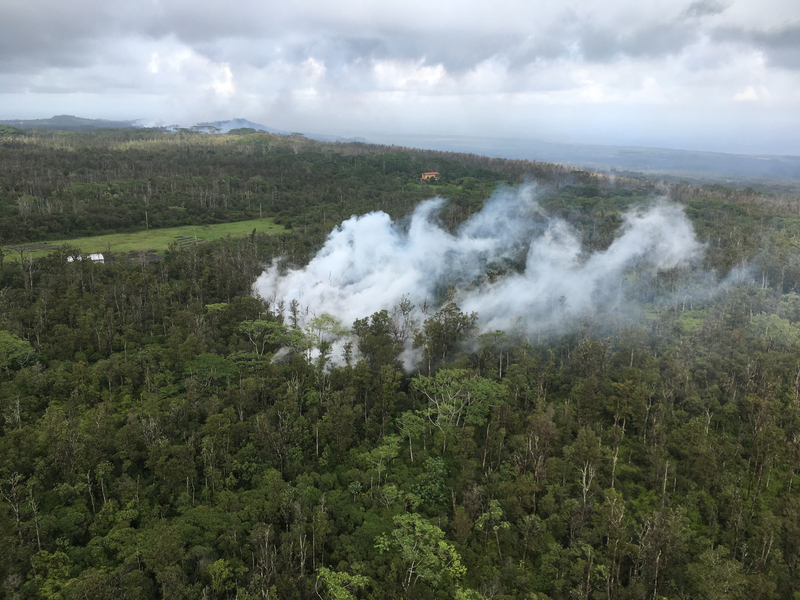 Aerial view from the Hawaii County Fire Department of fissure 15. 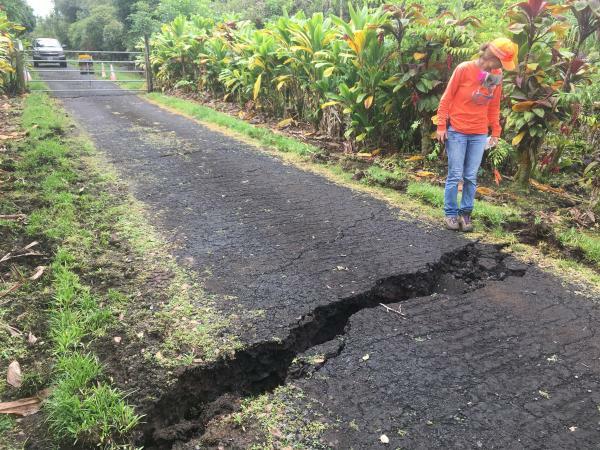 The fissure cut across Pohoiki Road. The summit lava lake in Halema‘uma‘u crater has dropped substantially over the past week due to intrusive and eruptive activity on the lower East Rift zone. 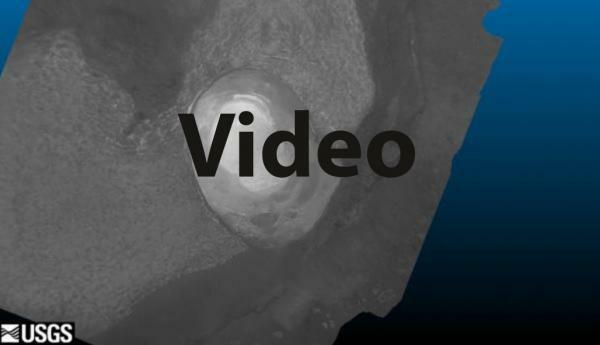 This 3D model of the crater was created from thermal images collected during a helicopter overflight on May 8. The lake at this time was roughly 295 m (970 feet) below the floor of Halema‘uma‘u Crater. At 16:22 HST. Steaming area located uprift (west) of Highway 130. Geologists observed many steaming ground cracks in the area during two overflights this afternoon. This area is inline with fissures 1-15 (in distance, upper left in photo), but located farther west. Left: This morning HVO geologists examined existing ground cracks on and near Highway 130. One crack on Highway 130 widened about 4 cm (1.6 in) in the past 24 hours. 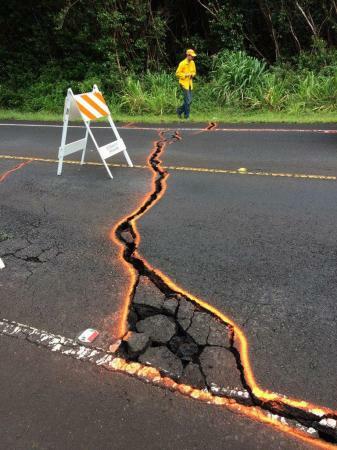 This crack located on Ala'ili road. 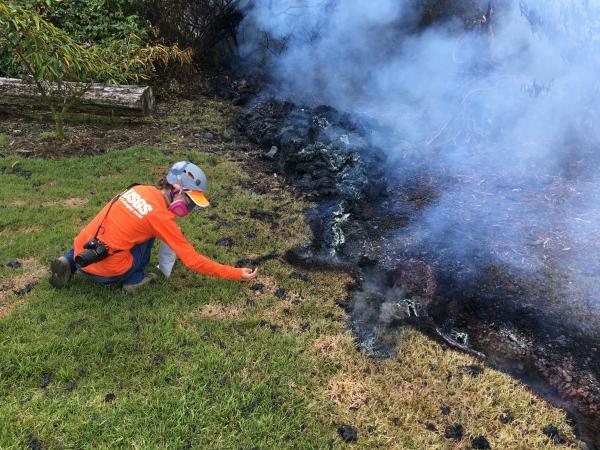 Right: HVO geologist examines a part of the inactive fissure 10 in Leilani Estates. Incandescence in the fissure was observed at a depth of about 1 m (yd). Left: At 2:47 p.m. HST. A new fissure (13) erupted across Leilani Street. View is toward the southwest on Leilani Street near the intersection with Pohoiki Road. Fissure 13 is located between fissures 1 and 6. 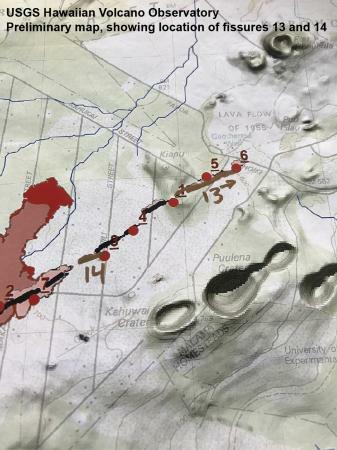 Right: Preliminary map showing location of fissures 13 and 14, prepared by geologists on site in Leilani Estates at 16:06 p.m. today. Both fissures were briefly active this afternoon. Geologists reported fissure 13 activity had diminished by about 5 p.m. HST. Aerial view of fissure 13 that became active mid-afternoon today. Left: At 07:00 a.m. HST, ground cracking extended across Highway 130. 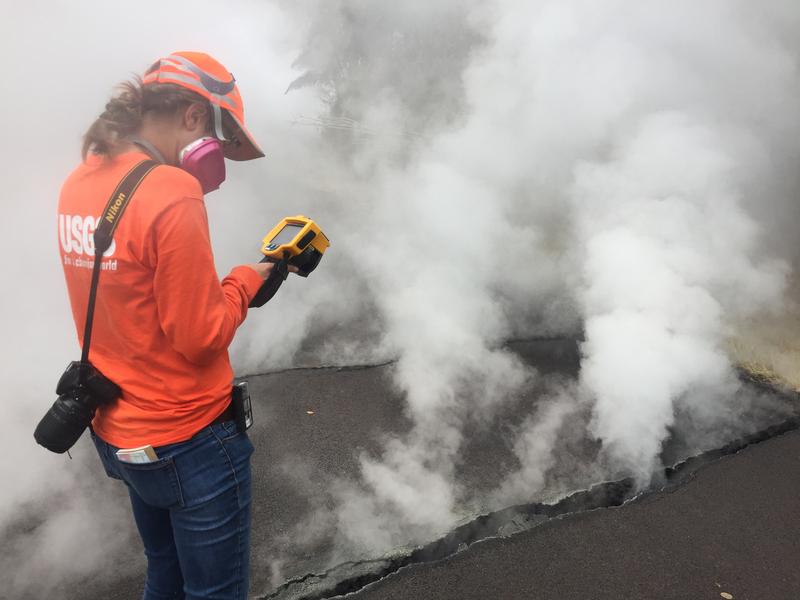 USGS-HVO scientists measured the width of the cracks and used a thermal camera to look for heat within the cracks (shown here), but no significant temperature difference was noted. The cracks spanned a 1.1 km stretch of the highway, which was closed to traffic. Right: Cracks in Highway 130 at 09:30 a.m. HST. Orange paint was used to outline the cracks. The road remained closed for much of the day. 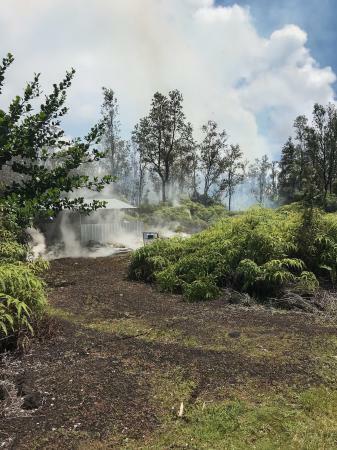 At 10:00 a.m. HST, steam rose from fissure 9 on Moku Street in the Leilani Estates Subdivision. HVO scientists on the scene reported hearing rumbling noises in the area. Left: At 12:20 p.m. HST, fissure 12 (shown here) opened shortly after fissure 11 became inactive. 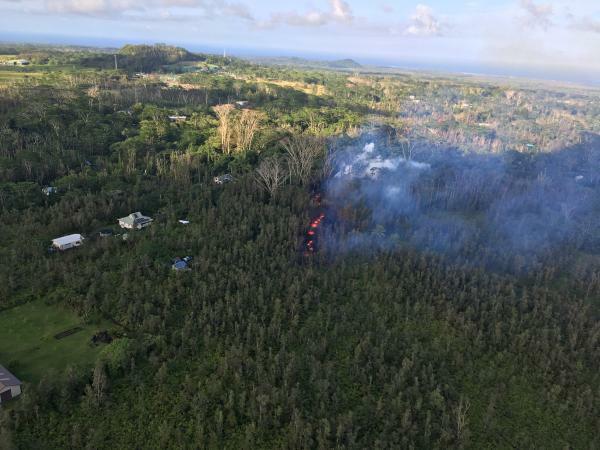 Fissure 12 opened in the forest south of Malama Street in Leilani Estates. 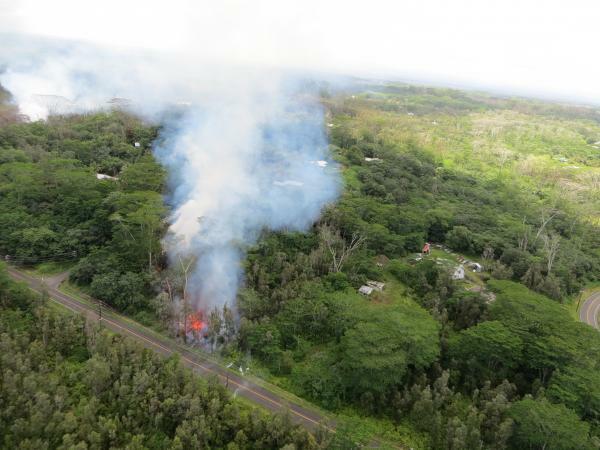 Right:Aerial view of fissure 12 at 1:15 p.m. HST. 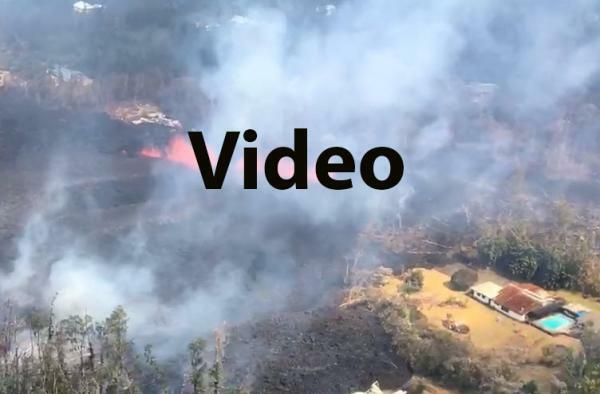 This video of Halema‘uma‘u lava lake from this evening shows the agitated lake surface caused by intemittent rock falls. Falling rocks are common since the lava lake level has dropped quickly, and exposed the walls. Yesterday the lake level was about 220 m (240 yards) below the crater rim and it continues to drop. 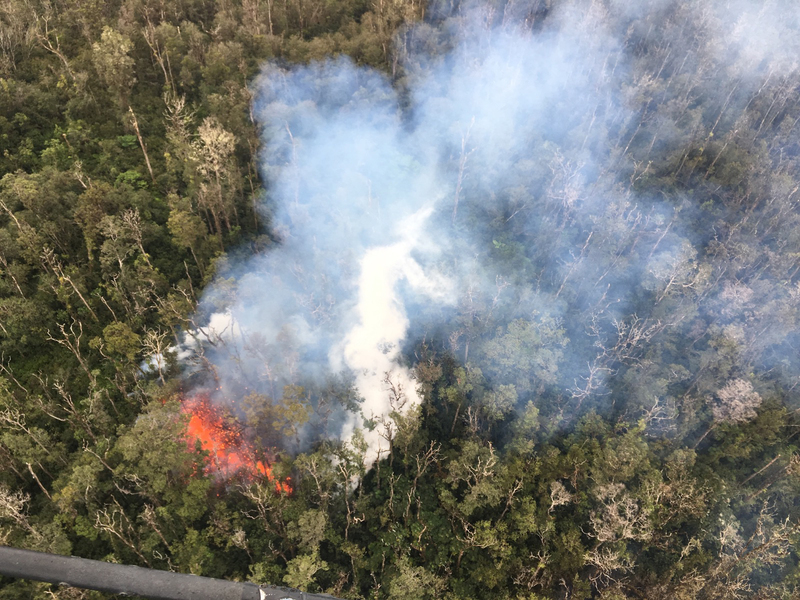 The summit lava lake has dropped significantly over the past few days, and this evening was roughly 220 m below the crater rim. This very wide angle camera view captures the entire north portion of the Overlook crater. 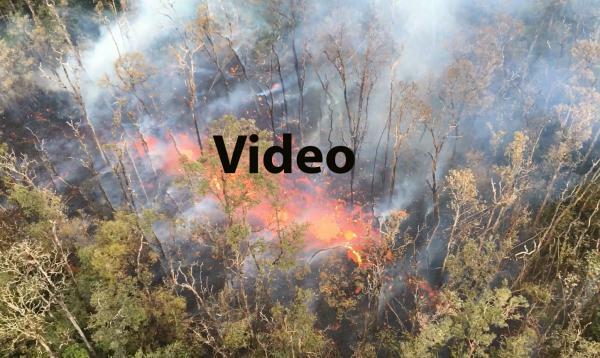 An overflight video from Leilani Estates this afternoon (May 6). Lava erupting from fissure 8 formed an ‘a‘ā flow, which advanced northward about 0.9 km (0.6 miles) by 10:30 a.m HST. 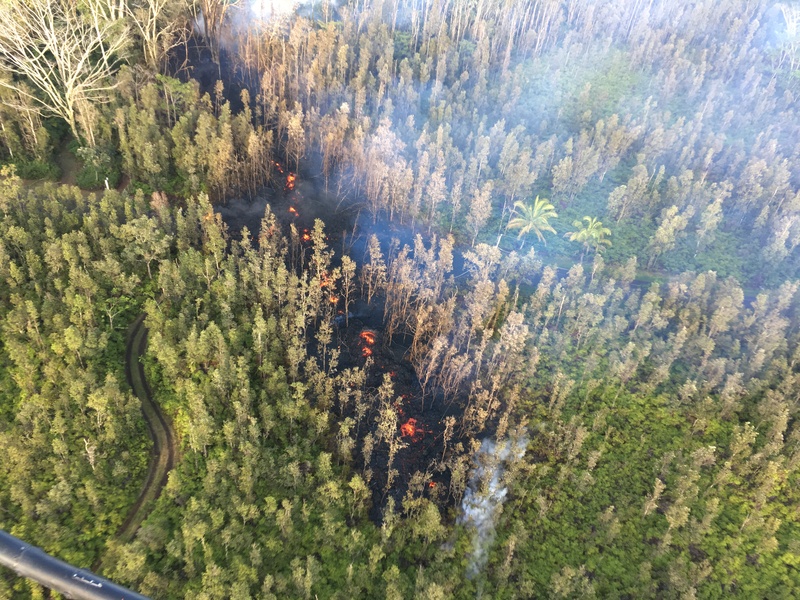 This fissure eruption diminished around 4:00 p.m., but the lava flow continued to advance slowly for several hours (last report at about 7 p.m. HST). 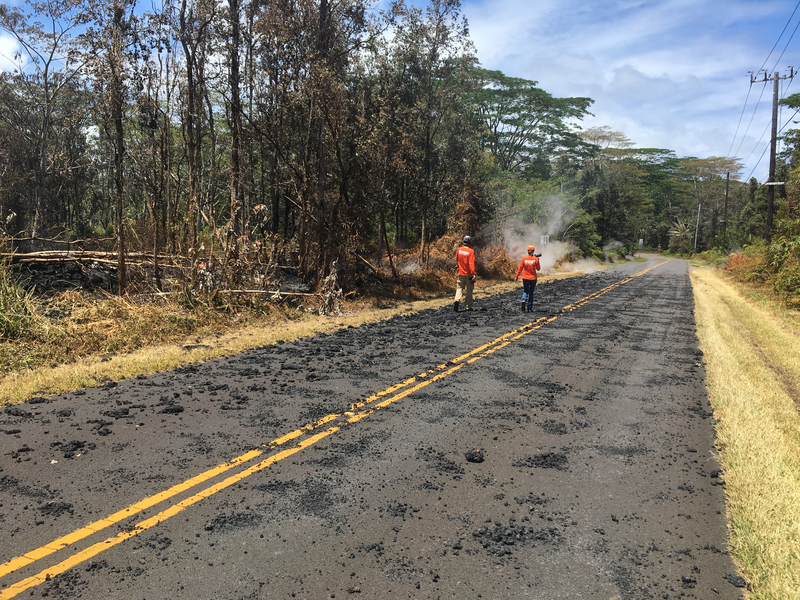 At 1:24 p.m. HST, May 6, 2018, USGS scientists monitoring the eruption in Leilani Estates walk past spatter that was erupted from fissure 5-6 on Leilani Avenue. 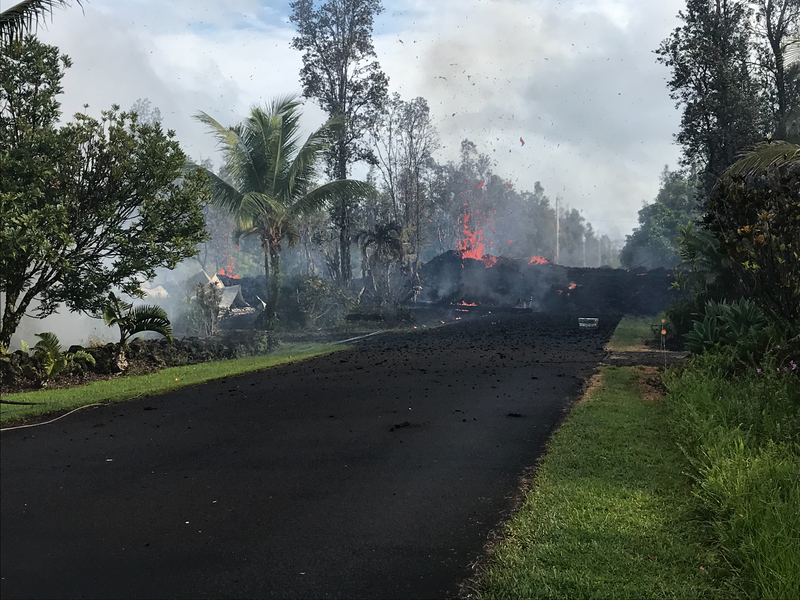 Left: A lava flow moves on Makamae Street in Leilani Estates at 09:32 am HST on May 6. 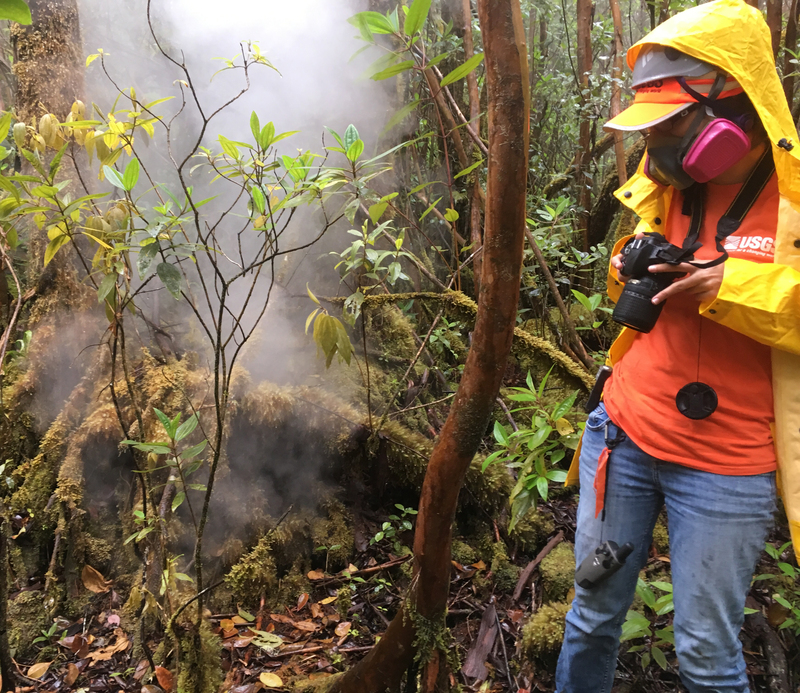 Right: As part of their monitoring work, HVO geologists collect samples of spatter for laboratory analysis; information gained from these samples sheds light on what's happening inside Kīlauea Volcano. This photo, taken at 10:35 a.m. today, shows fissure 10 near the intersection of Malama and Pomaikai Streets in Leilani Estates. 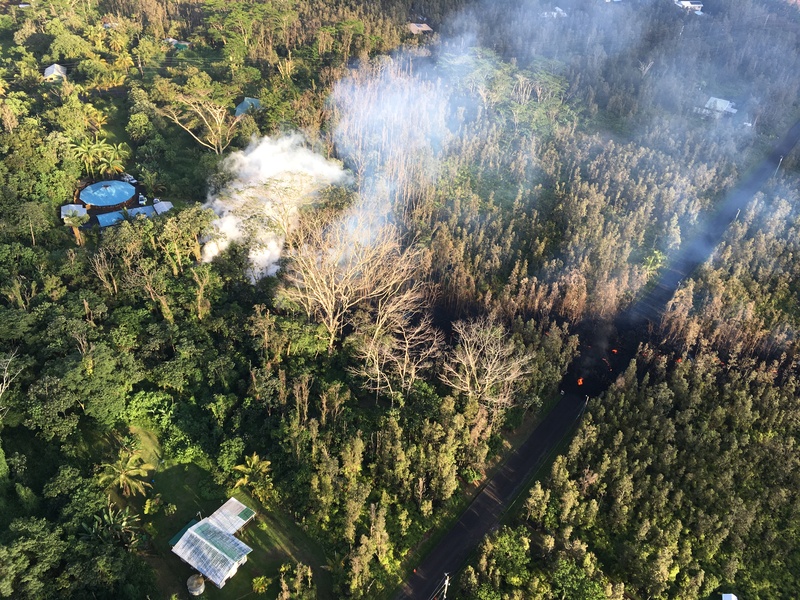 Left: A new fissure erupted this evening near fissures 2 and 7, beginning with small lavaspattering at about 8:44 p.m. HST. 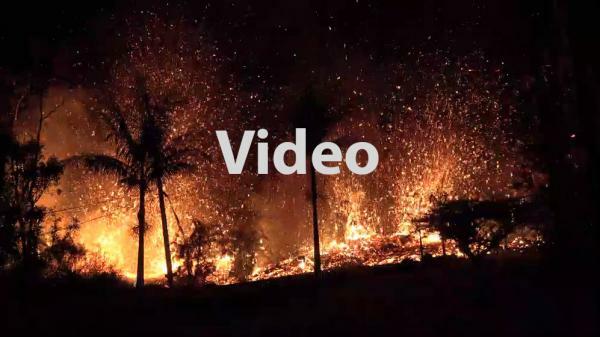 By 9:00 p.m., lava fountains as high as about 70 m (230 ft) were erupting from the fissure. 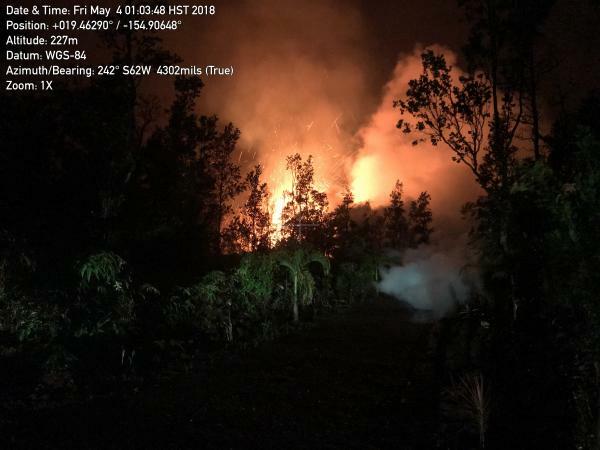 Right: VIDEO: Fissure eruption on Luana Road, between Leilani and Malama, in the Leilani Estates subdivision, at 9:37 p.m. HST on May 5, 2018. Fountains reached heights of up to 100 m (about 330 feet). 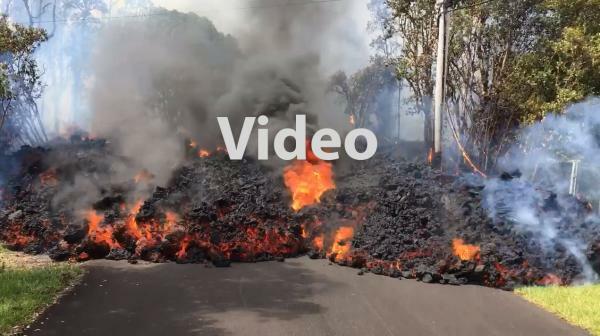 Video by Bruce Houghton, USGS and University of Hawaii. 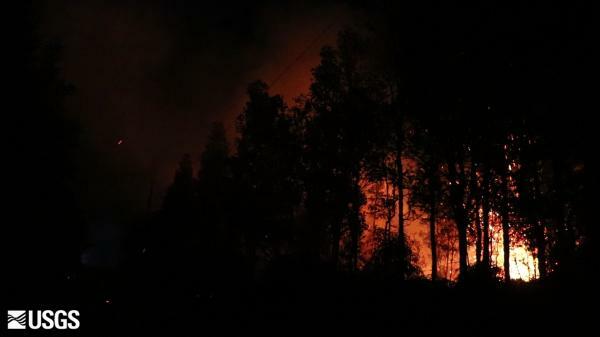 Fissure 7 began this morning around dawn and was active for several hours. At the peak of its activity, large bubble bursts occurred at one spot (lower left) in the fissure while spattering was present in other portions. A short lava flow was erupted from the fissure around 8 a.m. HST, moving northeast and crossing Hookupu St. 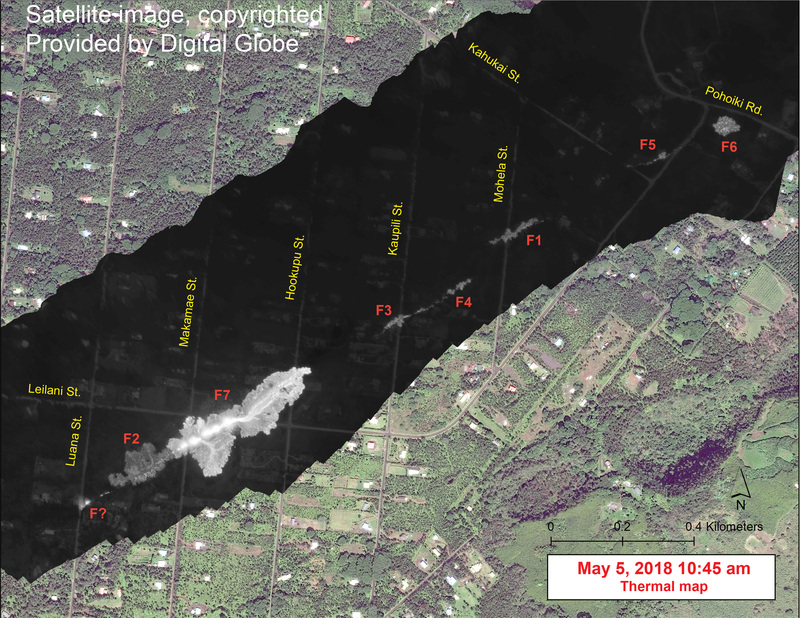 This map overlays a georegistered mosaic of thermal images collected during a helicopter overflight of the fissures in Leilani Estates, Island of Hawai‘i, at 10:45 a.m. HST on May 5. The base is a copyrighted satellite image (used with permission) provided by Digital Globe. Temperature in the thermal image is displayed as gray-scale values, with the brightest pixels indicating the hottest areas (white shows active breakouts). 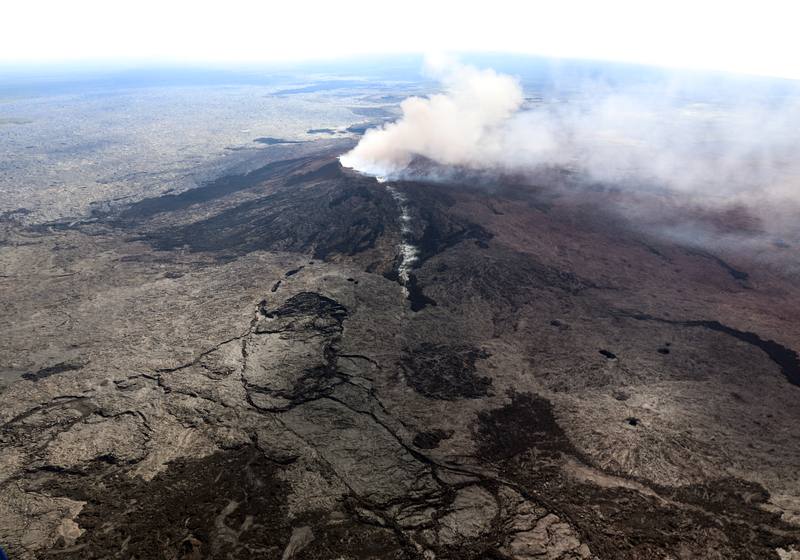 During the overflight, fissure 7 stands out as the first fissure to produce a small lava flow. When the thermal images were collected, the flow was about 260 m (853 ft) long. The thermal map was constructed by stitching many overlapping oblique thermal images collected by a handheld thermal camera during a helicopter overflight of the flow field. 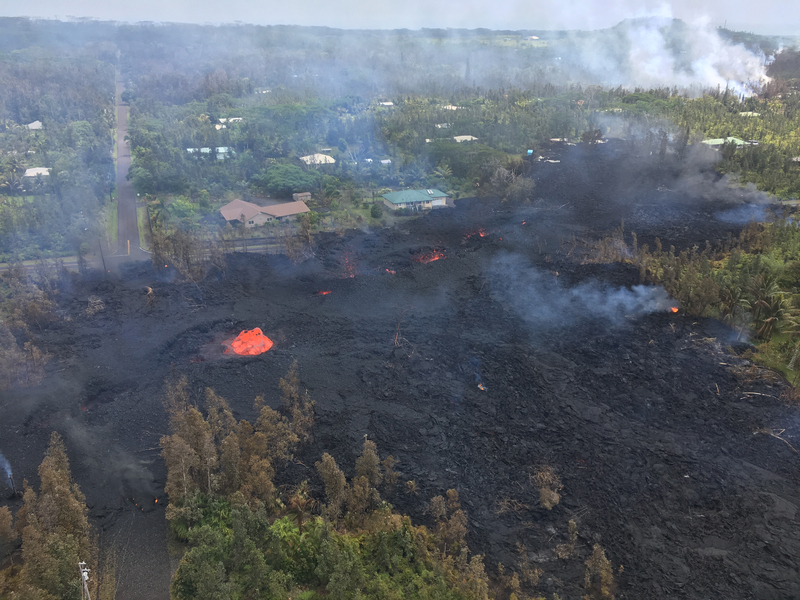 Left: At 07:45 a.m. HST, today, lava from fissure 7 slowly advanced to the northeast on Hookapu Street in Leilani Estates subdivision on Kīlauea Volcano's lower East Rift Zone. 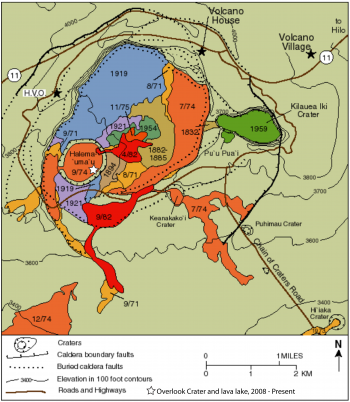 A map showing the location of the fissures is posted on HVO's website at https://volcanoes.usgs.gov/volcanoes/kilauea/multimedia_maps.html. 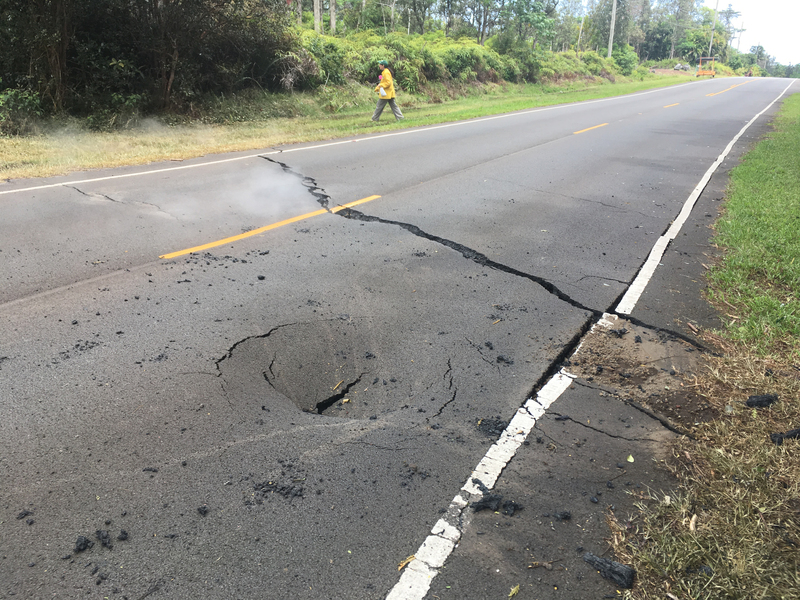 Right: At 12:26 p.m. HST today, a crack opened on Pohoiki Road just east of Leilani Street in the Leilani Estates subdivsion. A panoramic view of fissure 7 from the intersection of Leilani and Makamae Streets in the Leilani Estates subdivision. This photo was taken at 06:01 a.m. HST today. Left: A new lava fissure (Fissure 2) commenced around 1:00 am HST on Kīlauea Volcano's lower East Rift Zone on Makamae and Leilani Streets in the Leilani Estates subdivision. Spatter was being thrown roughly 30 m (about 100 ft) high at the time of this photo. Copious amounts of sulfur dioxide gas, which should be avoided, is emitted from active fissures. The eruption is dynamic and changes could occur with little warning. Right: Steaming cracks at 5:57 a.m. HST in Leilani Estates subdivision, moments before Fissure 3 opened up on Kaupili Street. 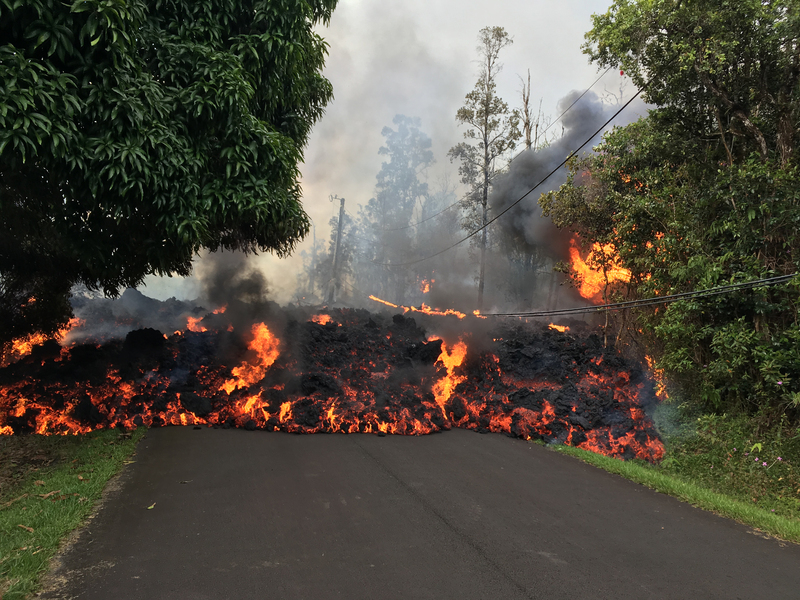 Left: Fissure 2 opened around 1:00 a.m. HST on Friday, May 4, with a small area of spattering in a residential driveway. Within an hour the spattering was more vigorous, with spatter reaching about 30 meters (100 feet). This spatter was thrown over the power lines and landed on Makamae Street. 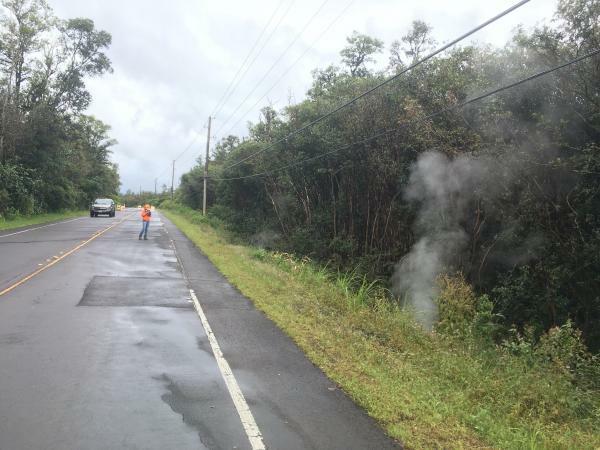 Right: Fissure 3 opened around 6:00 a.m. HST on Friday, May 4, with weak fuming from a crack on Kaupili Street. This fuming increased, as did rumbling sounds. Eventually spatter was ejected and accumulated around the fissure. Large, loud bubble bursts were common at this fissure. 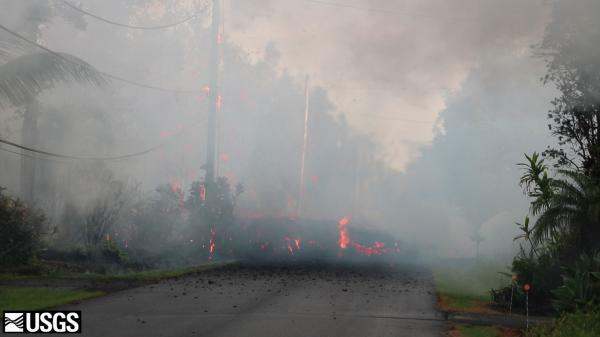 Fissure 3 at Leilani and Kaupili Streets in Leilani Estates subdivision at 8:07 a.m. HST today. Lava on the road was approximately 2 m (about 2 yd) thick. 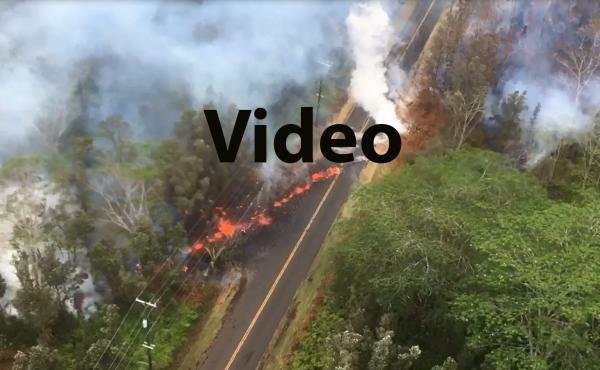 Left: Fissure 4 opened in forest around 10:39 a.m. between Kaupili and Mohala Streets. Right: Steaming cracks on Leilani Street--view is looking up rift. 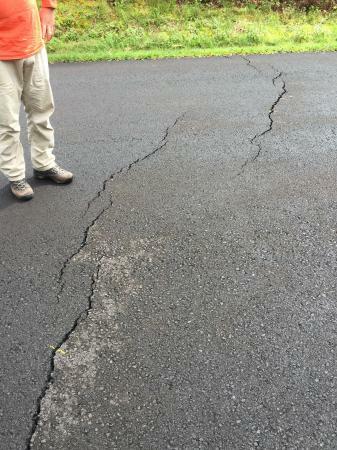 Crack in foreground opened during the 12:33 p.m. magnitude 6.9 south flank of Kīlauea earthquake. Left: Fissure 5 opened shortly before 12:00 p.m. in Leilani Estates subdivision--Leilani Street runs left to right at the bottom of the photo; Kahukai Street is the cross street. Right: Lavafrom Fissure 5 at 12:11 p.m., taken from similar vantage point as photo on the left. 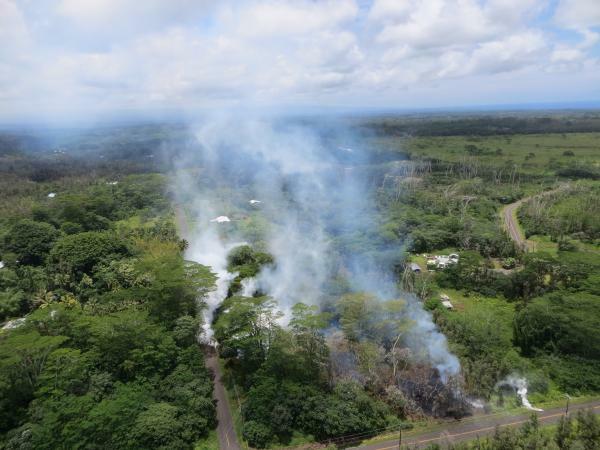 Eruptive area showing recent fissures in Leilani Estates subdivision when photo was taken at 12:07 p.m. HST. Fissure 5 is shown in the forefront. Another look at Fissure 5. Photo taken at 12:28 p.m. HST. Note the small finger that crossed Leilani Street (bottom right corner). 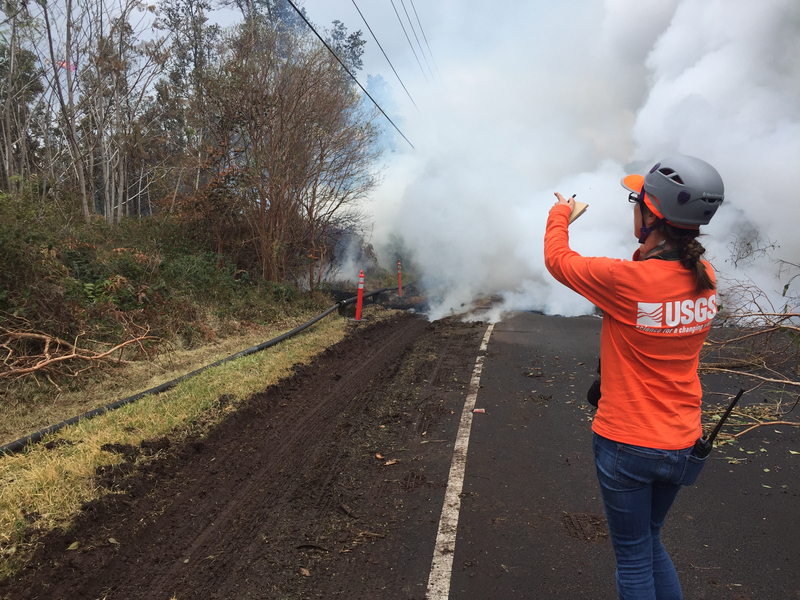 At 12:46 p.m. HST, a column of robust, reddish-brown ash plume occurred after a magnitude 6.9 South Flank of Kīlauea earthquake shook the Big Island of Hawai‘i. 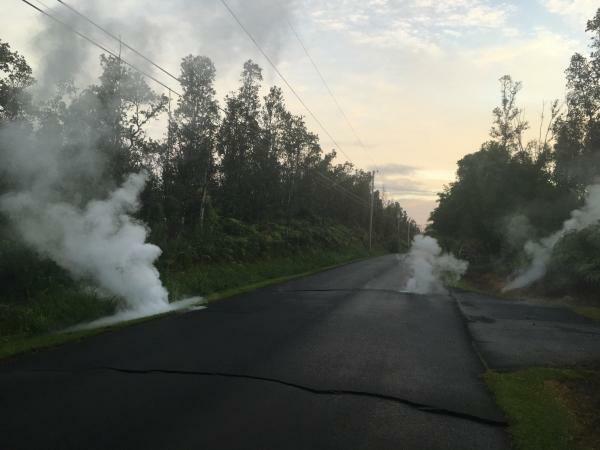 Left: An eruption has commenced in the Leilani Estates subdivision in the lower East Rift Zone of Kīlauea Volcano. White, hot vapor and blue fume emanated from an area of cracking in the eastern part of the subdivision. Spatter began erupting shortly before 5:00 p.m. HST. 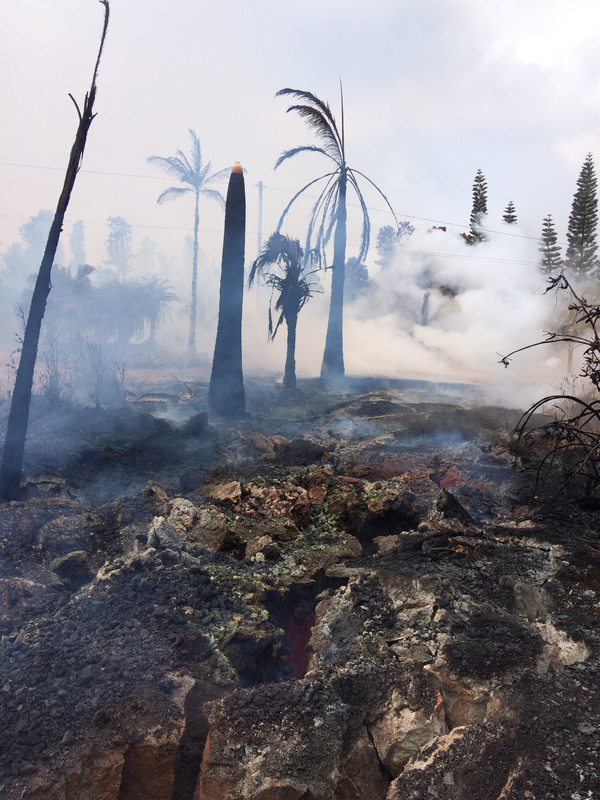 Lava was confirmed at the surface in the eastern end of the subdivision, in the areas of Mohala and Leilani Streets. 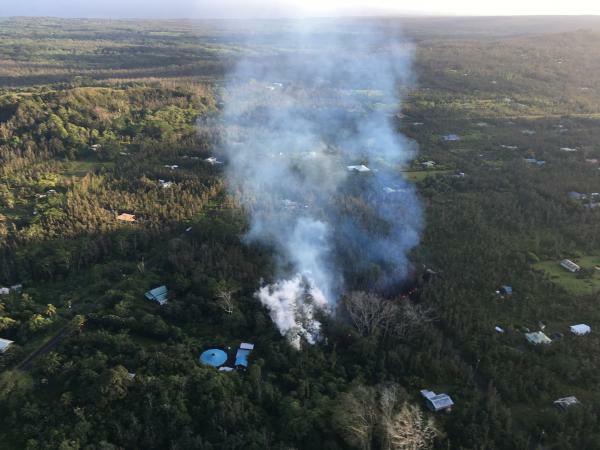 According to the Hawai‘i County Civil Defense update at 5:40 p.m., all residents in Leilani Estates and Lanipuna Gardens Subdivsions are required to evacuate. Right: The opening phases of fissure eruptions are dynamic. Additional vents and new lava outbreaks may occur. The fissure in Leilani Estates (as of 6:00 p.m.) was about 150 m (164 yards) long. Areas downslope of the erupting vent are at risk of lava inundation. 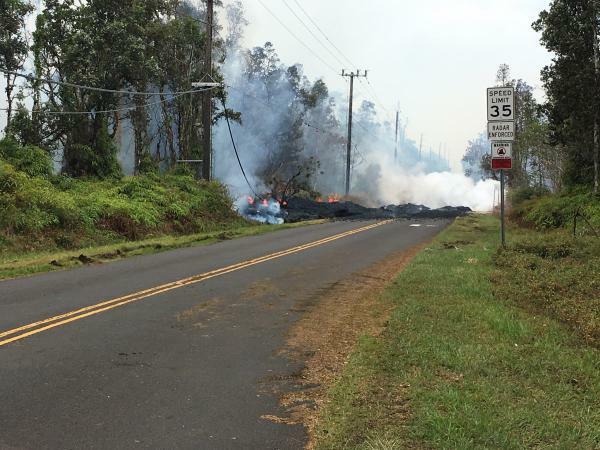 At this time, the general area of the Leilani Estates subdivision appears at greatest risk. Hawai‘i County Civil Defense is on scene and coordinating needed responses, including evacuation of the Leilani Estates and Lanipuna Gardens subdivisions. 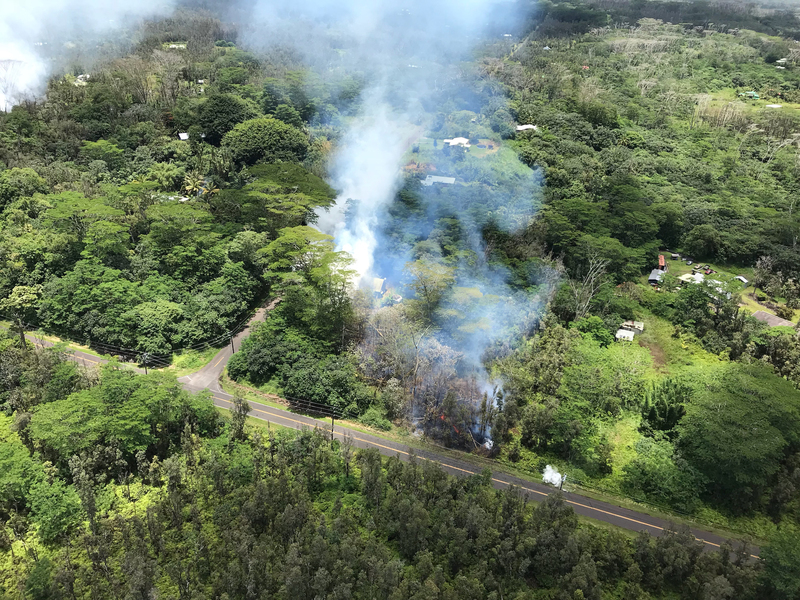 Residents of the lower Puna District should remain alert, review individual, family, and business emergency plans, and watch for further information about the status of the volcano. 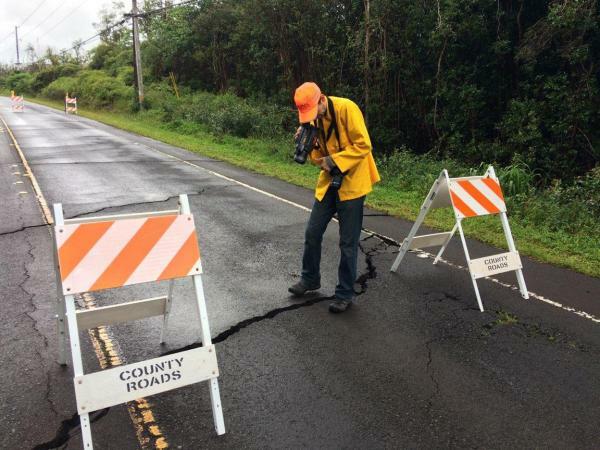 Hawai‘i County Civil Defense messages may be found at http://www.hawaiicounty.gov/active-alerts/. After a long period of rain and low clouds, improved weather and high clouds today allowed good airborne observations of the collapse crater in Pu‘u ‘Ō‘ō. This photo looks to the east, and shows the deep collapse crater formed on Monday, April 30, when magma beneath Pu‘u ‘Ō‘ō drained. For scale, the crater is about 250 meters (820 feet) wide. Left: This wide shot looks northeast, and shows the fissure that formed on the west flank of the Pu‘u ‘Ō‘ō cone (line of white steam). The fissure extends roughly 1.5 km (0.9 mi) west of Pu‘u ‘Ō‘ō Crater, and nearly reaches the bottom of the photograph. 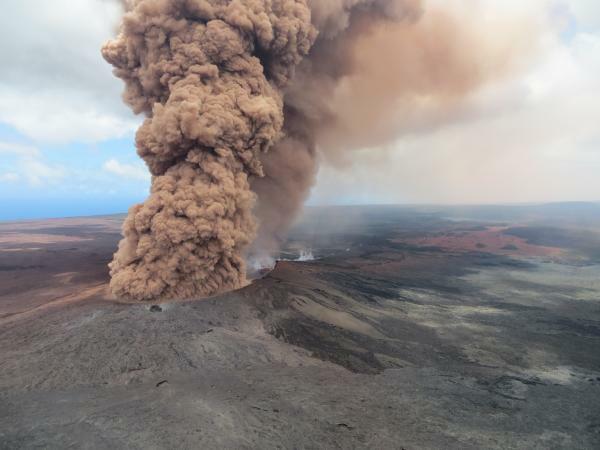 Right: Another wide view, from the east, showing the dust-rich plume and coating of reddish ash to the south of Pu‘u ‘Ō‘ō. Left: A view of Pu‘u ‘Ō‘ō from the east, shortly after a small collapse. The coating of red ashon the south side of the cone (left side of photo) is evident. Right: At 10:31 a.m. HST, while HVO geologists were working on Pu‘u ‘Ō‘ō, a magnitude-5.0 earthquake shook the ground around the cone. Moments later, a collapse occurred in the crater of Pu‘u ‘Ō‘ō, creating a robust, reddish-brown ash plume. HVO geologists confirmed that the Episode 61g flow is now inactive. Thermal images showed no active breakouts on the flow field. This photo shows the area where breakouts were focused prior to magma draining from Pu‘u ‘Ō‘ō earlier in the week. 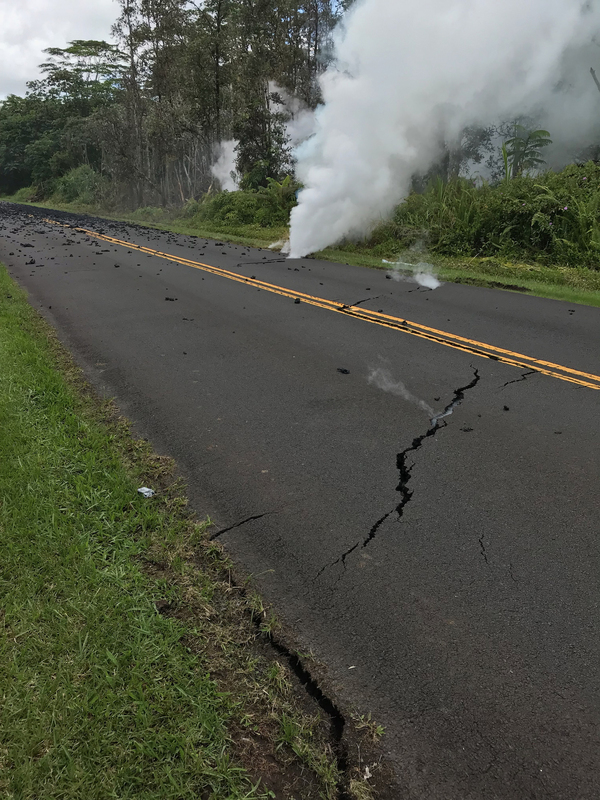 At 10:30 HST, ground shaking from a preliminary magnitude-5.0 earthquake south of Pu‘u ‘Ō‘ō caused rockfalls and possibly additional collapse into the Pu‘u ‘Ō‘ō crater on Kīlauea Volcano's East Rift Zone. A short-lived plume of ash produced by this event lofted skyward and dissipated as it drifted southwest from Pu‘u ‘Ō‘ō. Downwind areas may have experienced a dusting of ash from this plume. At this time, the 10:30 earthquake has caused no other changes at Kīlauea Volcano. HVO will continue to closely watch monitoring data for any changes. 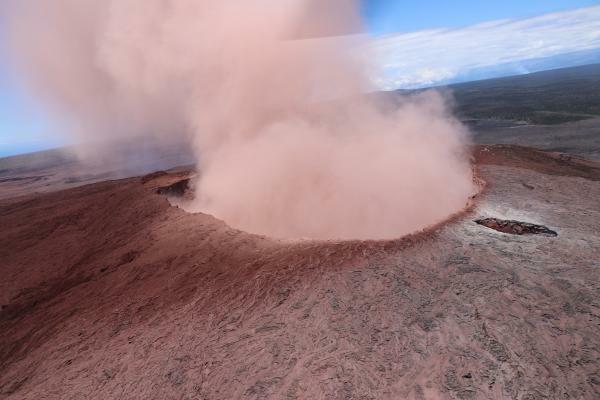 This image was captured from an HVO overflight carrying HVO scientists to the East Rift Zone for field work today. USGS photo by Kevan Kamibayashi. 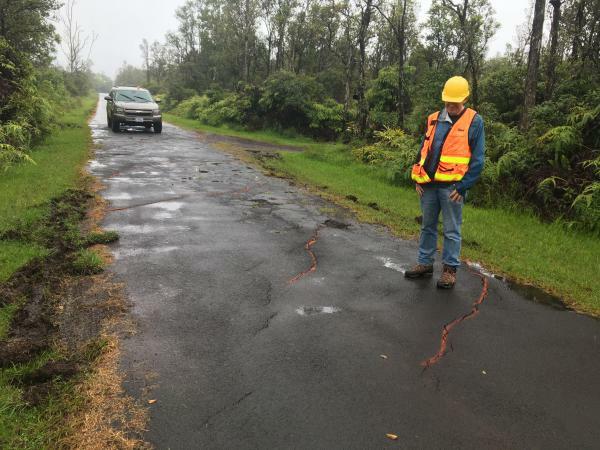 Puna residents reported to HVO geologists the recent appearance of ground cracks on a couple of roads in and around Leilani Estates. No steaming or heat were observed to originate from the cracks, and the cracks are currently still small (no more than several inches across). These cracks result from deformation of the ground surface due to the underlying intrusion of magma. Earthquake activity remains elevated in this area due to the ongoing intrusion.